Rapid developments in technology, the proliferation of WiFi enabled devices and the increasing use of internet based programmes in schools is changing the way students of all ages learn and interact with the world. 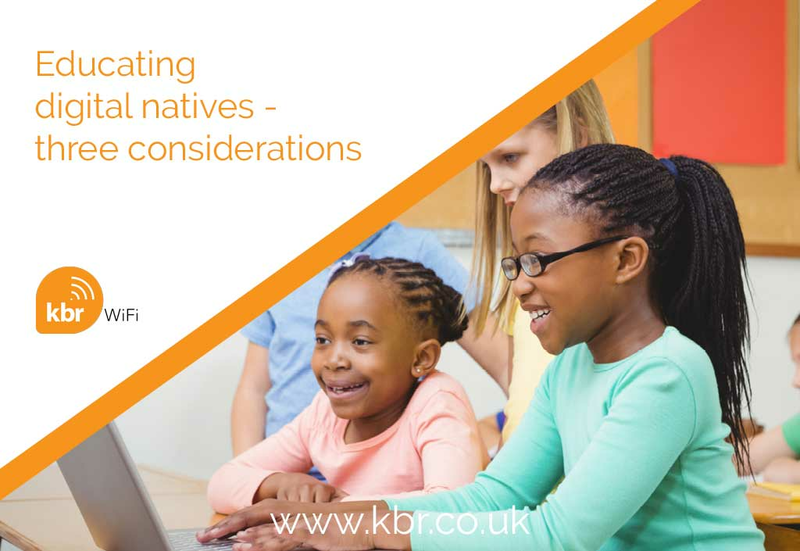 KBR has provided WiFi networking solutions and digital learning tools (such a interactive whiteboards) for many years. During our time specialising in schools across the UK we have had the opportunity to engage with, and speak to many teachers, IT managers and Heads of Schools about the impact of technology in schools. Here we share three core themes driving ‘digital’ decisions in educational establishments today. It’s no secret that children of all ages are online. Rather than retain vast amounts of information, they are fast becoming accustomed to ‘Googling’ the answer to a question or problem. A recent study by BBC’s Newsround suggested that more than three-quarters of children aged 10 to 12 in the UK have social media accounts, even though they are below the age limit. Among 13- to 18-year-olds, 96% were signed up to social media networks such as Facebook, Instagram, Snapchat and Whatsapp. With so much readily available access to the internet, many are questioning how best to respond to this in education. One school of thought is that teachers should spend time equipping students to judge the quality of information and its relevance to the problem they’re working on, rather than focus on encouraging the memorising of vast amounts of information. Many teachers are therefore focusing on engaging pupils in a dialogue and presenting them with the intellectual kitbag needed to find the answer, such as problem solving and analytical skills. This suits Generation C (the connected generation) who are empowered by technology to search out authentic content that they consume across all platforms and all screens, whenever and wherever they want. Every child is unique and every single one of us learns in unique ways. Many educationalists feel that the real promise of digital is the power it puts in teachers’ hands to move beyond the sharing mode of standardised knowledge, towards a model in which digital technologies enable the mass individualisation of learning. They are imagining a world where curriculum delivery is shaped around each individual pupil’s learning profile, and where the teacher acts as more of a coach, or guide than a lecturer. ‘Digital’ continues to disrupt many industries. From UBER’s taxi company with no cars, to AirBnB’s hotel service with no hotels, ‘digital’ is already prompting a lot of very fresh thinking. In 2013, Britain became the first country in the world to make computer programming a compulsory school subject at all levels. We’ve written a lot about the flipped classroom [LINK] which ‘flips’ the traditional structure of teaching – students view lessons and demonstrations on their computers outside of class, and then use classroom time to apply their learning under the guidance of their teacher. This lets teachers individualise instruction and allows students to learn at their own pace. ‘Teach-less-learn-more’ initiatives, cross-continent video and project collaborations – all with an emphasis on finding, evaluating and using rather than memorising are gaining traction. Digital learning shouldn’t stop or start at the school gate. But for over half a million British kids, it does. For their families, providing access to the Internet at home – devices, applications, broadband, parental support — is unaffordable. This access gap hits home on multiple levels. Over 50% of schools are now setting and allowing homework to be submitted using online tools and this isn’t possible for all students. It impacts schools too because a school that can’t rely on children completing a project on a computer at home can’t embrace tech and digital as fully as it needs to. The good news is that recognition of this digital divide is growing. Across the nation, concerned groups are tackling the issue head-on. The Government’s Pupil Premium provides extra cash which schools are free to use in ways that will most help disadvantaged children and the Department for Education has spent £125m setting up the Education Endowment Foundation (EEF), which is dedicated to breaking the link between family income and educational achievement. EEF identifies and puts money behind educational innovations that can help disadvantaged school children. These flashes of educational brilliance are on their way to becoming mainstream school routine, and it’s the schools embracing WiFi, digital and BYOD that are leading the way for future generations. For that to happen even more quickly, teaching tools and methods need to evolve, with more emphasis on collaboration and individualised learning, all underpinned by fast, take-it-for-granted digital connectivity and robust digital services. KBR are experts providing secure, reliable access to the internet across all devices. Our new KBR Secure solution provides holistic network security, allows users to use their own devices safely, enables web filtering and maximises coverage, whilst preventing skyrocketing support costs through it’s automatic application. Contact our team of experts to find out how we can support your school in this digital generation.